Helen has worked at Newman University since 1996. After completing her MA in postcolonial literature in 1995, she pursued her interest in African women’s literature by taking this as the subject of her PhD thesis, completed in 2001. Helen’s current research interests are in contemporary Black British writing around themes of Englishness, belonging and aesthetics. 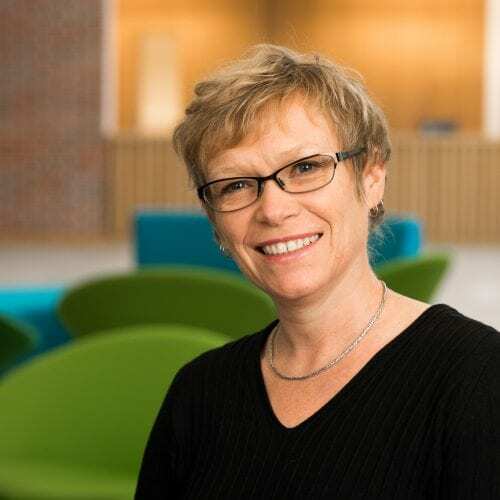 Helen is interested also in the pedagogic issues around induction and retention, and assessment and feedback in Higher Education and has been the recipient of several HEA awards to support work in this area. She is on the advisory board for Postcolonial Interventions: An Interdisciplinary Journal of Postcolonial Studies and an editor for The Literary Encyclopaedia (Anglophone African literature and culture desk). Helen is Programme Leader for the MRes Humanities programme. Helen’s teaching interests include research methods (at both postgraduate and undergraduate levels) and postcolonial literature. Helen is currently writing a book on Black British Literature in relation to the broader English literary canon. She will be co-editing a Special Issue of the journal Tulsa Studies in Women’s Literature on Black British Women’s Writing (with Dr Elisabeth Bekers, Vrije Universiteit Brussel and Dr Elizabeth-Jane Burnett, Newman University) due to be published in 2022. She has a particular interest in the writing of Helen Oyeyemi. She is also interested in human to nonhuman animal metamorphosis within contemporary literature, and will be contributing to a volume of essays on literature and Animal Studies due to be published in 2019. Helen welcomes enquiries about PhD or MRes in either Black British literature or African women’s writing. Helen is a member of CWWA, EACLALS and the PSA, and a founder member of the Black British Women Writers Network. She is an editor for The Literary Encyclopaedia, Anglophone African literature and culture desk. She is a Senior fellow of the HE Academy. Helen has been invited to speak on her research in Black British literature at the Helen Oyeyemi Symposium (Darlington Campus, Teesside University, 18 February, 2015); and at the ‘Black British Women’s Writing Network’ International Symposium (Vrije Universiteit Brussel, 20 March 2012) where the Network was launched. She was also invited to present at the Contemporary Women’s Writing Association Symposium: ‘Contemporary Women’s Writing and Literary Prize Culture’ (Leeds Metropolitan University, 24 June 2013) with her colleague Dr Jenni Ramone, Nottingham Trent University; following the publication of their edited volume on The Richard & Judy Book Club (http://www.the-cwwa.org/conferences/contemporary-womens-writing-and-literary-prize-culture/). Helen is Chairing the Organizing Committee for the next Postcolonial Studies Association conference which will take place in 2019. She presents regularly at the Postcolonial Studies Association conferences (University of Leicester (7-9 September 2015); University of Leicester (7-9 September 2015); Waterford, Ireland (6 – 8 May 2009)). Helen most recently attended the Afroeuropeans: Black Cultures and Identities in Europe Sixth biennial network conference at the University of Tampere, Finland (6 – 8 July 2017) for which she co-organised, and presented as part of, a Black British Women’s Writing Network double panel. She has also presented at a Black British Women’s Writing Network panel at Mobilising Memory: Creating African Atlantic Identities CAAR Conference 2015, Liverpool Hope University (24-28 June 2015) and presented at Black British Women’s Writing: Tracing the Tradition and New Directions Conference of the Black British Women’s Writing Network, University of Brighton (9 July 2014). Helen also convened two panels with Pauline Dodgson-Katiyo at the African Literature Association conference, University of Bayreuth (3-6 June 2015) associated with the special issue of African Literature Today that they co-edited (published in 2016). Helen also regularly presents at Association for Commonwealth Literature and Language Studies conferences, including ‘The Current Unbroken; The Circuits Kept Open’: Connecting Cultures and the Commonwealth 16th Triennial ACLALS Conference, St Lucia (5 – 9 August 2013); Strokes Across Cultures 15th Triennial ACLALS Conference, University of Cyprus, Nicosia, Cyprus (6 – 11 June 2010); and Bodies and Voices European Association for Commonwealth Language and Literature Studies Conference, Copenhagen (21–27 March 2002). Cousins, H. (forthcoming 2018) ‘Lindsey Collen’s narrative gift: a challenge to the commodification of African literature’ Research in African Literature 49(2). Cousins, H. (2016) ‘Returns “Home”: Constructing Belonging in Black British Literature – Evans, Evaristo and Oyeyemi’ African Literature Today 34: pp. 185-199. Cousins, H. (2016) ‘“Zimbabweanness Today”: An Interview with Tendai Huchu’ African Literature Today 34: pp. 200-210. Cousins, H. (2014) ‘Class Online: Digital Representations of African Middle-Class Identity’ (with S. Adenekan) Postcolonial Text 9(3): [online]. Cousins, H. (2012) ‘Helen Oyeyemi and the Yoruba Gothic: White is for Witching’ Journal of Commonwealth Literature 47(1): pp. 47-58. Cousins, H. (2012) ‘Unplaced/Invaded: Multiculturalism in Helen Oyeyemi's The Opposite House’ Postcolonial Text 7 (3): [online]. Cousins, H. and Dodgson-Katiyo, P. (2016) (eds.) African Literature Today 34 special issue ‘Diaspora and Returns in Fiction’. Cousins, H. and Dodgson-Katiyo, P. (2012) Emerging Perspectives on Yvonne Vera. Tenton, New Jersey: Africa World Press. Cousins, H. and Ramone, J. (2011)The Richard and Judy Book Club Reader: popular texts and the practices of reading. London: Ashgate. Cousins, H. (2017) ‘As white as red as black as … beauty, race and gender in the tales of Helen Oyeyemi, Angela Carter and Barbara Comyns’ in S. Ilott and C. Buckley (eds.) Telling it Slant: Critical Approaches to Helen Oyeyemi. Eastbourne: Sussex Academic Press: pp. 167-184. Cousins, H. (2016) ‘Black British Writing and an English Literary Belonging’ in K. Andrews and L. Palmer (eds.) Blackness in Britain. London and New York: Routledge: pp. 77-88. Cousins, H. (2012) ‘African Short Stories and the Online Writing Space’ (with S. Adenekan) in Paul March-Russell and Maggie Awadalla (eds.) The Postcolonial Short Story. London: Palgrave Macmillan: pp. 199-213. Cousins, H. (2012) ‘Dwelling in Zimbabwean Land: An Ecocritical Reading of Yvonne Vera’s Short Fiction’, in Cousins, H. and Dodgson-Katiyo, P. (eds) Emerging Perspectives on Yvonne Vera. Trenton, New Jersey: Africa World Press: pp. 23-40. Cousins, H. (2011) ‘A Good Authentic Read: exoticism in the postcolonial novels of the Richard & Judy Book Club’, in Ramone, J. and Cousins, H. (eds) The Richard and Judy Book Club Reader. London: Ashgate: pp. 137-153.